Having seen many errors in SQL Server Replication, I can say that the vast majority of them are reported at replication agents level like Distribution Agent, Log Reader Agent, Snapshot Agent, Queue Reader Agent, and so on. 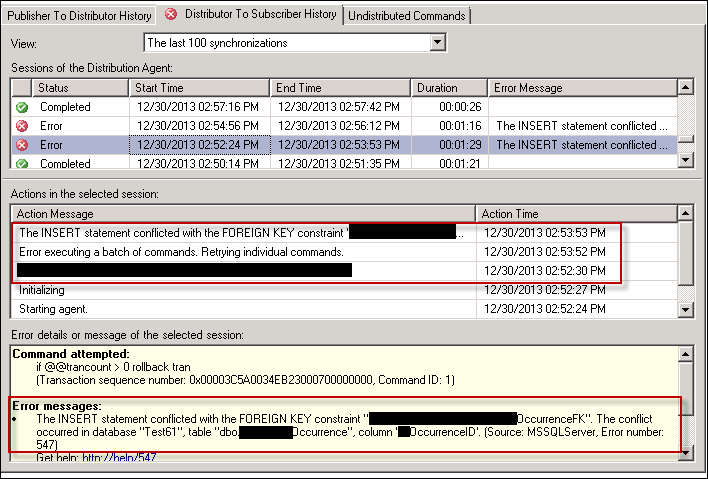 Unfortunately, some of them are mostly related to Primary and Foreign Key conflicts, and to solve them either one by one or by reconfiguring the replication we may need much time, therefore, we need to look for an option to allow the operation to continue while we work to fix them as soon as possible. Luckily, this option is the 'SkipErrors' parameter which I have used many times to deal with them. Likewise, you can use it for skipping other errors. 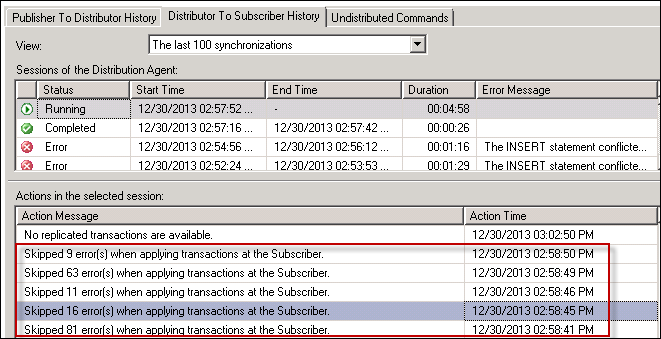 Today's post will show how to use the' SkipErrors' parameter which allows to skip specific errors so that the data synchronization process is not stopped. This parameter is configurable in the profile of the Distribution Agent and has as input the error number we may want to skip. 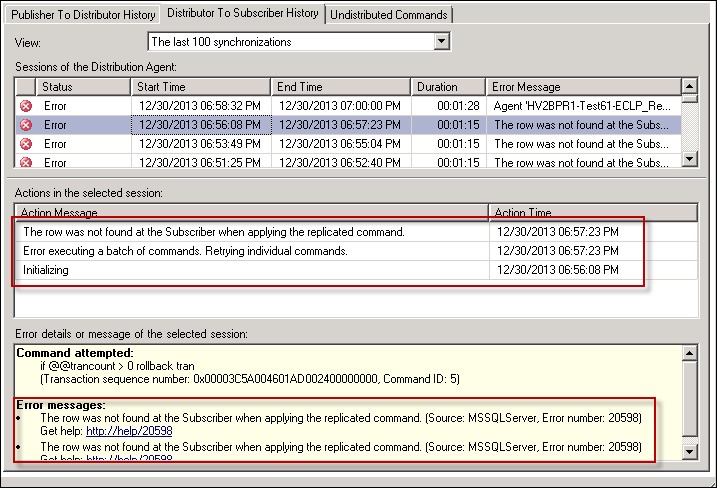 Other common errors where you can use 'SkipErrors' parameter is when there are not some rows in the subscriber to apply the changes (The row was not found at the Subscriber when applying the replicated command). The error code for this case is 20598. I mentioned before that the 'SkipErrors' parameter is configurable inside the Distribution Agent profile and that is what we are going to do right now. 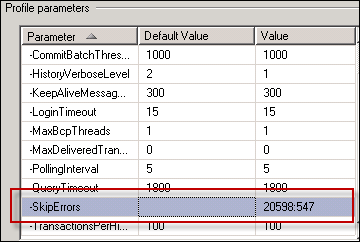 Firstly, we need to create a customized profile based on the Default profile and write in the 'Value' column the numbers of the errors (to be skipped) separated by colons as we can see in the following picture 20598:547. Having done that, we may have to restart the Distribution Agent. Next time the Distribution Agent starts up, it will load the new customized profile with the error codes to be skipped (ignored). Finally, not only will we verify that many errors are skipped, but also the Distribution Agent is running with no problem. Just to finish writing this post, keep in mind that the transactions with these errors were missed, which means that you will not be able to recover them and may affect your data consistency. In other words, we must use 'SkipErrors' parameter with extreme caution. Let me know any remark you may have. Thanks for reading.